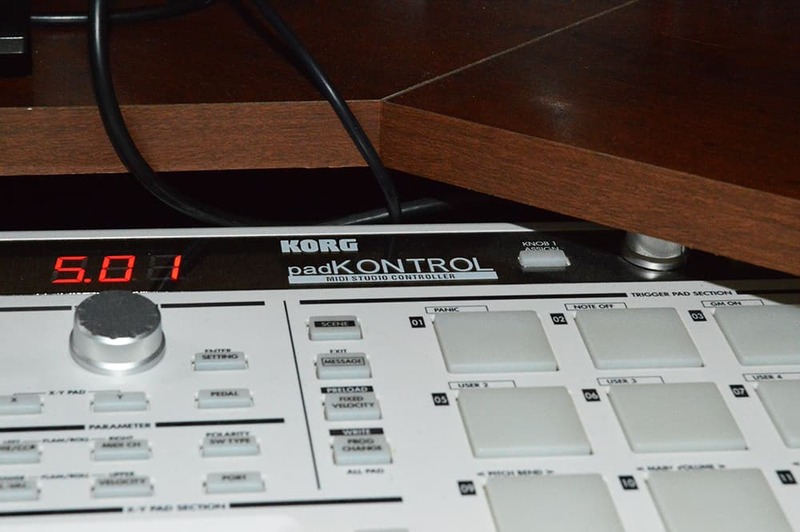 The KORG padKONTROL just may be the best midi controller on the market. Before I get into the specifics, grab a snack, sit back and relax because.. The concept of playing drums with your fingers has become an odd and controversial one in recent years. If you were to tell someone in 1975 that you were triggering sounds with a square piece of plastic and 16 soft pads, they would most likely laugh at you. In 2016 and beyond it has become commonplace. Though I have gotten some less than flattering remarks over the years, it doesn’t change the fact that I love using the padKONTROL, and always have. It gives us musicians an easy way to vent our frustrations and stress after a long day. It’s therapeutic! For a long time, my go to stress relief was banging out a sample on the padKONTROL. There’s just something so magical about hearing a sample come together to form a really nice beat. But as for the unit itself? Where do I even begin. This little beast of a machine held up for me from 2007 all the way until 2016. 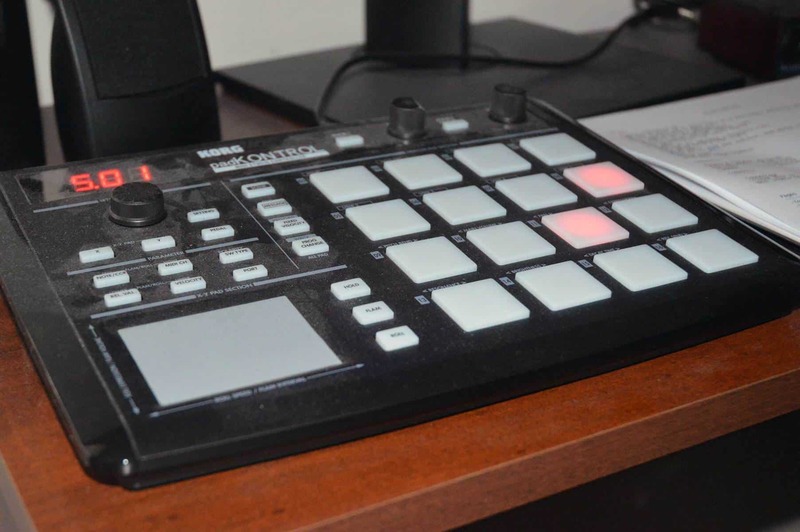 Out of all the studio equipment I’ve ever had, the padKONTROL got by far the most use. The only reason I sold it was because the knob that you see pictured (under the 5.01), broke on a flight to Greece somewhere in luggage claim. Being that it’s such a rock solid piece of equipment, I can only surmise that reckless handling of my bag had something to do with it. I traveled with it quite a bit and it’s always been very reliable. Even after it broke, I continued to use it because it still worked! I was still able to make songs, although it was much harder because the knob that broke is what enables you to switch between keys and sounds. Out of the box, it’s really easy to set up and runs off of USB. Just plug and play. To sync it up with your sequencing program is super simple as well and usually involves going into preferences/midi options, etc. and doing an “auto detect”. Each program varies slightly in it’s method. I’ve used Reason and FL Studio since I started making beats, and haven’t really desired to veer away from them. Over time, you will come to realize that it’s not the program that matters, but instead what you do with it, and how much time you’re willing to spend learning it. So choose one or two and stick with them. When I started out, I used Reason and then moved to FL studio because I enjoyed sampling more than making original beats. FL is more conducive to sampling, while Reason is great for originals. That said, to set up the padKONTROL for either is quite simple. If you’re padKONTROL is working and recognized by Windows, it should appear under “input.” It will say padKONTROL1 MIDI IN, (generic controller), Active. Make sure “padKONTROL 1 PORT A, and padKONTROL 1 PORT B are both active as well! If not you won’t hear anything. If your device doesn’t show up under MIDI Input, just go back to Options and under the MIDI Section make sure “MIDI Output” is checked. Hold the scene button, and tap a pad. Drag a sample from your folder onto one of the pads. If you have sound packs, they will be under your browser on the left hand side in FL Studio. If you’re dragging samples, refer to this guide on how to sample in FL Studio. Click the pad that you assigned the sound or sample to. Press the same pad on your padKONTROL. Click next to Midi Note in the upper right hand corner. Whatever note you played will appear (C3 for example). Click the pad to make sure it’s assigned! A really powerful tool inside FL Studio is the Cut by. After you’ve assigned sounds to your pad, they may overlap when you trigger them with your finger, leaving you in a heap of frustration. All you want to do is bang out those samples but if every time you hit a pad, the same note plays, then you’re in for a headache! The cut by allows for extreme flexibility and control, by cutting the sample off as soon as you hit the pad again. Just change each of those values to 1. Voila! Now make some magic happen baby! Open up Redrum. Create > Redrum Drum computer. Find a Kick, snare or hat in your sound pack. It should automatically assign to the padKONTROL in Scene 16. So basically, a great way to get rolling is to lay down a sick beat, and the build off of that. As far as sampling in Reason, you will need Reason’s ReCycle. I used it a lot when I first got into sampling, but wouldn’t recommend it. It’s kind of limited with what you can do. FL Studio’s Edison is my go-to. How to sample in FL Studio! The pads on this controller feel amazing. They are very sensitive and trigger quite easily. You hardly have to hit them at all before a sound registers. Nice! I suppose this is personal preference, but I put more stock into softness and sensitivity than I do in the size of the pads themselves. I will take this to the grave with me. This thing looks amazing. It always has, and always will. There’s just something about it that I can’t quite put my finger on. When idle, the pads light up and go through a series of patterns, which looks really cool in the dark (for those late night sessions). The pads also light up every time you hit them, which is kind of a small detail but still nice. I had a very specific goal in mind when shopping for drum pads. Convenience. That said, The padKONTROL has a great feature that I thought I would mention. The X-Y pad. Amazing. Some don’t think too highly of it, but when I was first starting out and experimenting, I wore this thing out. It’s great for just that: Fooling around and what not. Pads are extremely responsive and feel great. Pads light up, which is a cool effect at night. Reliable. Will stand the test of time. There is a small learning curve, being that it’s just a simple MIDI controller, and doesn’t actually play any sounds of it’s own (What is MIDI?). A basic understanding of how MIDI works. A PC that will support KORG drivers. A sequencing program such as the ones we discussed in this article. An audio interface or preamp for better sound. Preamp vs. Interface. Studio monitors for mixing. JBL LSR 305 Review! Mixing headphones. Sennheiser HD 600 Review. The 600’s just happen to be the best. You could go with the Sony MDR V6’s and do just fine. You could realistically just use your laptop and the pad and bang out beats that way. I did it for a long time with a pair of Sony MDR 7506’s and was happy. Just so you know, the MDR V6 and 7506’s are nearly identical, with just a few differences. Sony MDR V6 vs. MDR 7506. A stellar piece of equipment that will stand the test of time. It’s just a really fun piece of hardware to tinker and play around with. The learning curve isn’t “easy” by any stretch, but it’s not hard. I’d consider it intermediate. You will get the hang of it relatively quickly. With a beautiful layout, and some cool features, there is a potential for loads of fun with this beast! Well that’s about it for today my friend! 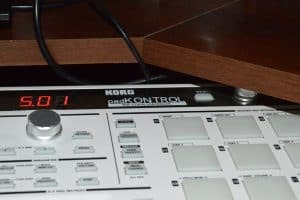 I hope you enjoyed this article on The KORG padKONTROL! If you have any questions or comments, please leave them below or Contact me!! I look forward to hearing from you..
What do you think?? Do you have any experience with this piece? Let me know!! Cheap midi keyboard drum pad | TWO GREAT OPTIONS!